I’ve noticed that my kids are miserable if we don’t get out of the house and go somewhere every day. Many of my friends have commented on how many places we go, but they don’t know the dark truth: we must get out or we will eat each other alive. But sometimes this plan backfires. It certainly did this Wednesday. 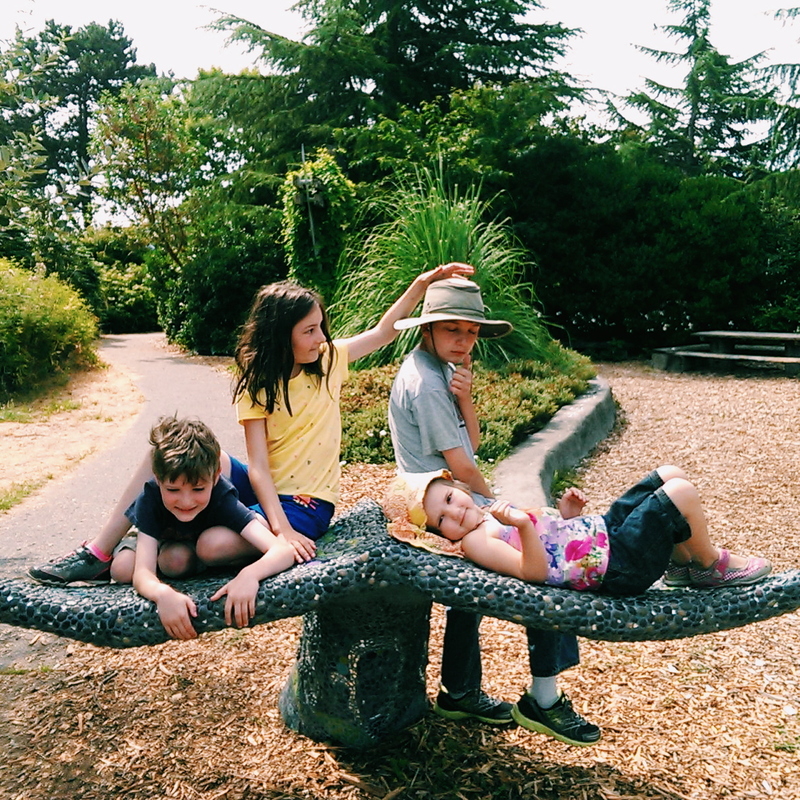 We decided to spend the morning finding the Children’s Garden in Magnuson Park. I had read a lengthy description of it on the web, and it sounded marvelous: a climbing hill with a lookout on top! A “snack wall” with berries! A “tea party” garden with mint and other edible herbs! A whale statue to climb on, and a stack of logs to play with! Well . . . some of those things were there (no snack wall, no tea party room). The whale statue turned out to be a tail with a whale-shaped garden bed next to it. Yes, this means two days in a row of children posing on whale tail statues. The lookout hill would have been a fun thing to climb for a five-year-old, and the stack of logs? More like a pile of chopped wood to build things with. On the whole, the garden was much, much smaller than we thought. It would have been a fun place to play, I think, if we hadn’t had such completely different expectations. So . 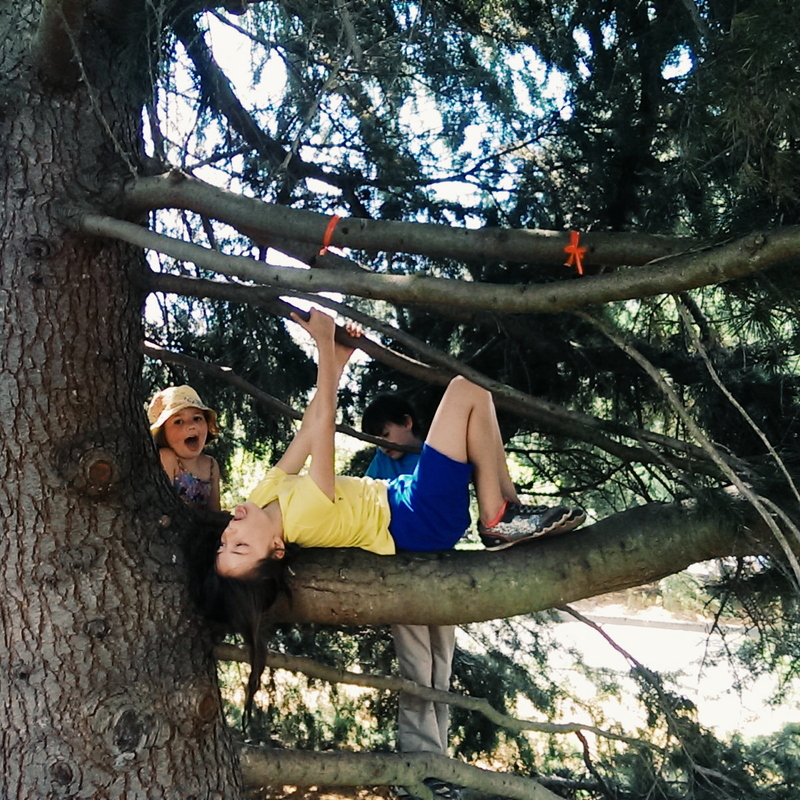 . . instead of happy children exploring a new place, I had sulky children whining about being bored every thirty seconds. Eleanor was the worst offender. She shimmied up this tree for a nice long sulk. 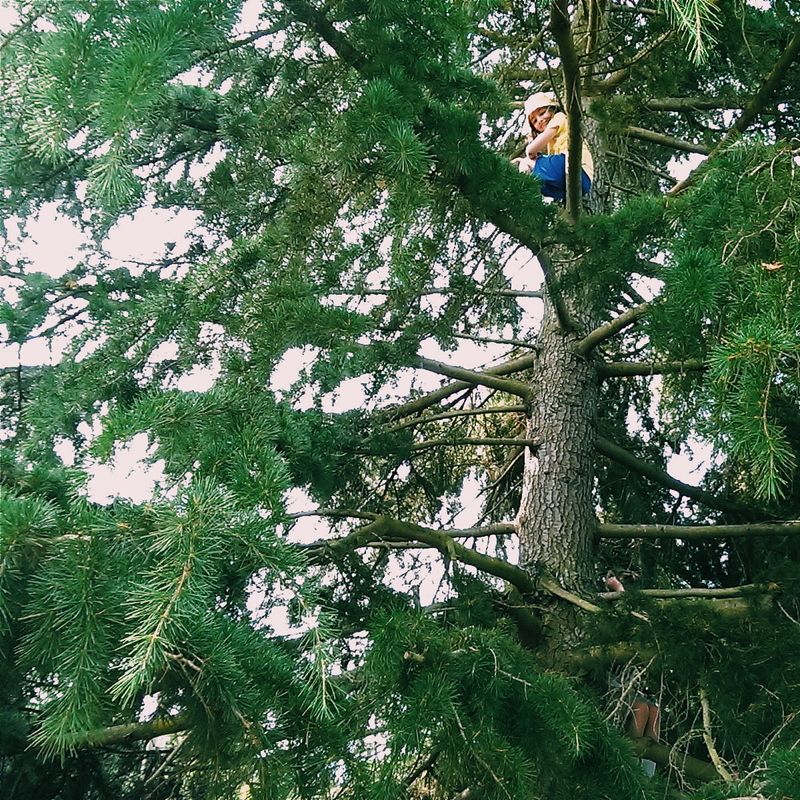 You have to admit it’s an amazing climbing tree. William and Katie eventually got into it, and some friends also stopped by for a picnic, and Jeff had fun with them, but Eleanor pretty much stayed in the tree and asked when we were going home, again and again and again. 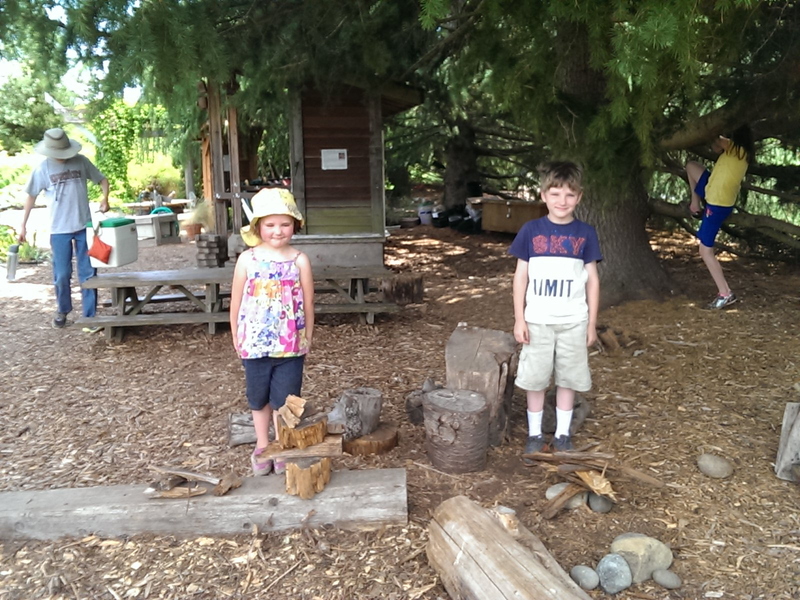 Wim & Katie spent time making towers out of the wood. 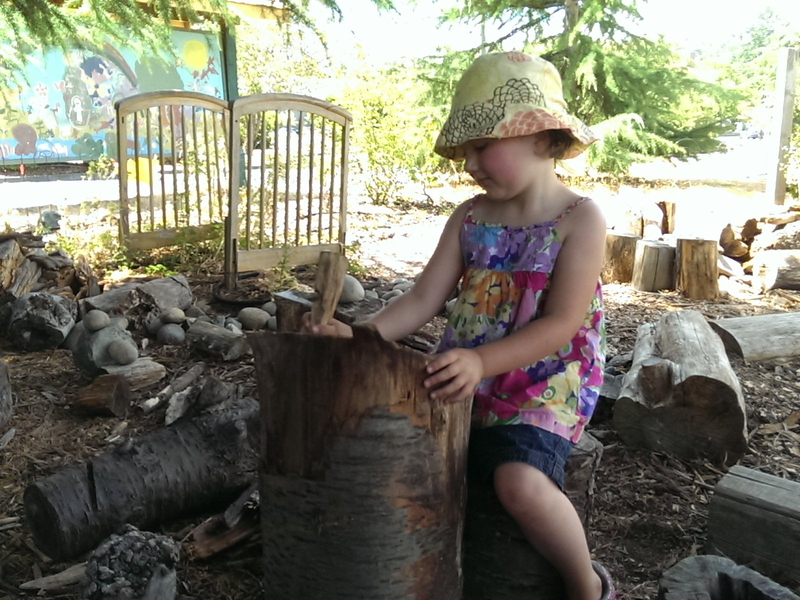 Katie pretended this stump was her writing desk. To say that Eleanor has been trying my patience this summer would be a massive understatement. “Smile, Eleanor!” and she did this . . .